Teenage clothing has never been more chic. Anika is wearing the very stylish and unique Jumpsuit in Venezia. She is 5'6". All Jam & Bread clothing is made in the USA with a keen attention to detail. 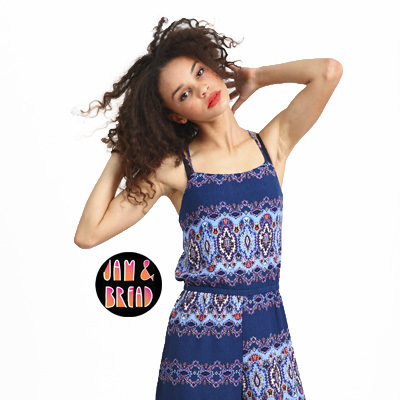 Unlike other teenage clothing, our dresses are age appropriate yet cool. She'll feel confident and self-assured our unique line of teenage clothes, designed with the young woman in mind. Whether it's teenage dresses or teenage clothes that you're looking for, you can shop with confidence knowing it has the same style, attention to detail, and quality that you've grown to expect from TwirlyGirl. And just like our teenage dresses, all of our teenage clothing is easy to care for. Simply machine wash and tumble dry low, or line dry. No special care or dry cleaning is necessary. All of our teenage clothing is made in limited quantities, so that she can dress as unique as she is, yet still look fashion forward. We're very proud to be unlike any other brand in our category. Our teenage clothing can be dressed up or down, depending on the occasion. It exactly this kind of versatility and comfort that will make this teen jumpsuit a clear favorite in her wardrobe. You'll also notice that all of our teenage clothes have their own dedicated size charts. You can find them next to the pink add to cart button. Take measurements, that way you can be sure to get the best possible fit. We make shopping our our site as easy and user friendly as possible. If you have any questions at all, please be sure to reach out to us. We want everyone to leave with a smile on their face and a little swag in their step.